What 80's/90's cheap car would you love to make mid-engine and awesome? The SHOgun; a storied and amazing creation. 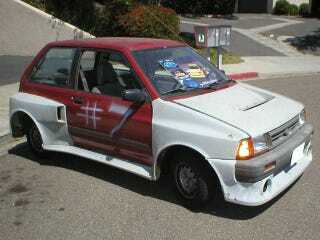 The Festiva, plus a SHO taurus engine in the back. Startling fun. Making something America lacked; awesomeness the Fiero didn’t deliver. So what cars we can get off craigslist for pocket change today, would you love to throw an engine in the middle? This guy is working on a mid-engine Fox Mustang with a coyote motor and a G50 Porsche transaxle. The last post on progress was May ‘17. It appears he was working out how to do the bodywork to resemble some of the old Trans-Am Motorcraft Mustangs. Plenty of cars could work with transverse 4's and v-6's, but what about balanced transaxle power? What sedan-like cars would fit that transaxled v-8 ls, v-10 triton truck monster or bmw/jag/merc v-12?